Add a video for "Lumberjack 20"
On November 5 2009 at 1:34 p.m., a terrorist named Major Nidal Hasan attacked fellow soldiers and civilians at Fort Hood, TX. He killed 12 soldiers and one civilian and wounded 43 others. 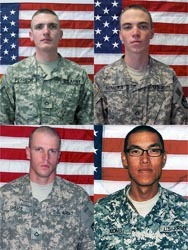 The "Lumberjack 20" Hero WOD was first posted on crossfit.com as the workout of the day for December 5, 2009 (091205).